A rare puppet of the television bear Sooty has fetched more than 10 times its estimated sale price at auction. The puppet, thought to be one of the mischievous bear's earliest incarnations, was used by Harry Corbett in the original 1950s BBC series. 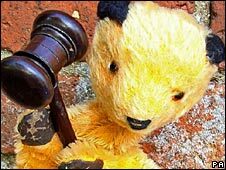 Entertainer Richard Cadell - who bought the rights to Sooty earlier this year - paid £3,100 at the sale in Derby. He plans to display the glove puppet on the North Pier in Blackpool where Corbett bought the very first Sooty. It was completely yellow but Corbett sewed on a black nose, mouth and ears so the puppet would stand out on black-and-white television. Corbett's additions to the puppet were what gave it its name. The bear went on to become a mainstay of children's TV over several decades, despite never uttering a word. A spokeswoman for Hansons Auctioneers said there had been a lot of interest in Sooty. "The salesroom was heaving. We've never seen it so busy. "We've had inquiries from Australia and New York. "It's always a shame when things go abroad, so we're very happy it's staying in the country." Mr Cadell added: "We're going to give him back to the people of Blackpool. "Blackpool people very much regard Sooty as their own son and he's going home."